Over our nine seasons of bringing ferociously imaginative work to the stage, it has been the dedication and generosity of our family of donors that has enabled us to, time and again, bring the impossible roaring into reality. By making a fully tax-deductible donation today, you’re joining the community that forms the backbone of Pipeline Theatre Company. We are currently raising funds for our upcoming 10th season which includes the world premiere of Kevin Armento, Jaki Bradley, and Marcus Miller’s Playing Hot. This is absolutely the best time to join the Pipeline family of donors. As a Crusader (at the $1,000+ level) or a Magic-Maker (at the $100-$500 level) you are at the core of the Pipeline family, and a vital part of making our work possible. Our Crusaders and Magic-Makers receive a wide-array of exclusive benefits, including access to opening nights and special parties, invitations to private rehearsals, and dinners with key members of our team. When you make this much of an impact, we put you in the center of our work, right where you belong. Click here to learn about the astounding group of individuals you’ll be joining as a Pipeline donor. As a small but mighty company, gifts at every level make a big difference. Don’t see a level that’s right for you? Click here to give any amount. One pair of premium tickets to our VIP Night and reception for Playing Hot. Priority booking through a personalized concierge on staff. Recognition in all printed materials. One pair of premium tickets to our Opening Night and reception for Playing Hot. An invitation to a cast read-through of Playing Hot. Your name on a plaque. Advanced notice of Season 11 programming. An invitation to our 10th anniversary dinner. Our pair of premium tickets to our Opening Night and reception for Playing Hot. Are you an avid online shopper? 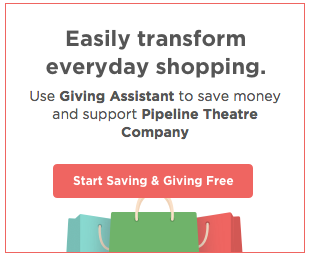 Well there are several ways to make a donation to Pipeline while your shopping at no extra cost to you! Shopping on Amazon.com? 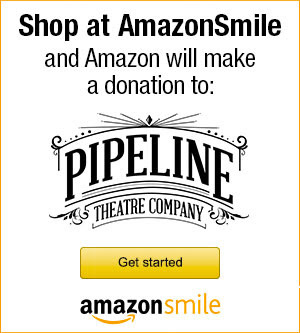 Click here to designate Pipeline as the charity you’d like to support and then from now on shop through smile.amazon.com (it’s exactly the same we swear!) and Amazon will donate .5% of the cost of your purchases to Pipeline, without charging you anything extra. It’s that easy! Shopping elsewhere? Like getting discounts and supporting Pipeline? Join Giving Assistant! Shop online at stores like Macy’s, Bloomingdales, Forever 21, Bed Bath & Beyond, and Kmart and you’ll earn 3-30% cash back AND Pipeline will get a small percentage of the proceeds of your purchase. Click here to learn how.